Edie Falco is officially heading to Pandora. On Wednesday, February 6, 20th Century Fox announced that the Sopranos and Nurse Jackie star has joined the cast of the upcoming Avatar sequel movies. The studio broke the news on Twitter, sharing a tweet to the page for the Avatar film franchise. 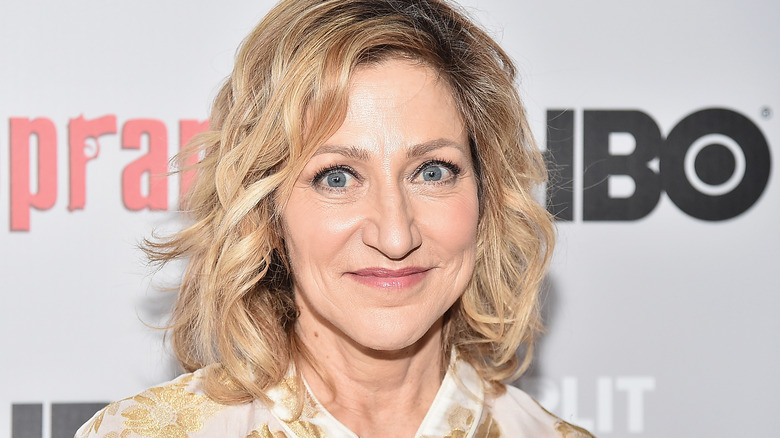 "We are thrilled to share that Edie Falco is joining the #AvatarFamily as General Ardmore, the Commander in charge of the RDA's interests in the Avatar Sequels! Are you as excited as we are?" the tweet reads. Producer Jon Landau gushed about Falco's casting in the four Avatar follow-ups, writing in his own post on Facebook, "I am EXCITED. Edie, welcome to the Avatar family." Apart from the super-short summary of Falco's character provided in the announcement tweet, we know nothing about how she will fit into the new Avatar films. It's safe to assume (and assumptions are all we can make at this point in time) that General Ardmore is probably one of the bad guys, as she works for the Resources Development Administration, a non-government organization that owns monopoly rights to all products (like the incredibly valuable material known as unobtainum) obtained from Pandora and other locations in space outside of Earth. Both Parker Selfridge (Giovanni Ribisi), the corporate administrator in charge of the RDA's mining mission on Pandora who had little regard for the well-being of the Na'vi people and only cared about making money for shareholders, and Colonel Miles Quaritch (Stephen Lang), the head of the RDA's security detail on Pandora, were the two big villains in the original Avatar from 2009. Unless Falco's General Ardmore ends up more compassionate and empathetic than her fellow RDA executives, she's likely going to be a well-dressed, well-educated, materialistic baddie. Piecing together the information we've heard about the Avatar sequels, the films should be incredibly interesting, to say the very least. Director James Cameron noted back in 2016 that the collection of films would feel like "a family saga about the struggle with the humans," and that the storylines will heavily focus on Sam Worthington's Jake and Zoe Saldana's Neytiri and their children. He later revealed that Lang's Colonel Quaritch is returning (despite seemingly dying from multiple arrows to the chest) and will act as the central villain across all four sequels: "The interesting conceit of the Avatar sequels is it's pretty much the same characters. There are new characters and a lot of new settings and creatures, so I'm taking characters you know and putting them in unfamiliar places and moving them on this greater journey. But it's not a whole bunch of new characters every time. There's not a new villain every time, which is interesting. Same guy. Same motherf***er through all four movies. He is so good and he just gets better. I know Stephen Lang is gonna knock this out of the park." In that same discussion with Empire, Cameron also detailed that the sequels are "a greater narrative broken up into four complete stories," similar to how Peter Jackson's Lord of the Rings films felt. "It's one big story. But I would say a little bit different from The Lord of the Rings, which you knew was a trilogy and that allowed you to accept a sort of truncated ending for movies one and two and then a fulfillment," he shared. Elsewhere, Cameron admitted that there is a lot riding on Avatar 2 and Avatar 3, the financial success (or lack thereof) of which will determine whether the fourth and fifth films even get made. "If Avatar 2 and 3 don't make enough money, there's not going to be a 4 and 5," said Cameron. "They're fully encapsulated stories in and of themselves. It builds across the five films to a greater kind of meta narrative, but they're fully formed films in their own right." However Falco's character positions herself in the forthcoming Avatar films, she will certainly have fun working with fellow franchise stars Worthington, Saldana, Lang, and Ribisi, as well as returning actors Sigourney Weaver (who is said to reprise her role as Dr. Grace Augustine), Joel David Moore, Matt Gerald, and C.C.H. Pounder. Falco won't be the only newcomer either — she joins Cliff Curtis (Fear the Walking Dead) as reef clan leader Tonowari, Oona Chaplin (Game of Thrones) as the strong and vibrant Varang, and A-list actress Kate Winslet as reef clan member Ronal. Known for her roles on Nurse Jackie and The Sopranos as well as for her work on Law & Order True Crime: The Menendez Murders, Falco will make her Avatar franchise debut when Avatar 2 is released on December 18, 2020. The films that follow – Avatar 3, 4, and 5 — will premiere on December 17, 2021, December 20, 2024, and December 19, 2025, respectively.